How Did All Of These Trucks Manage To Avoid Wrecking? 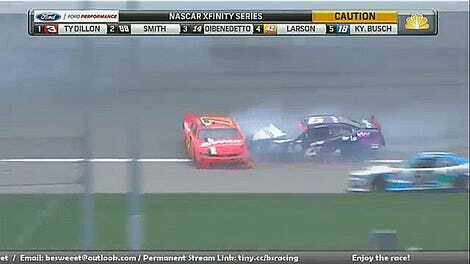 A vehicle wrecking at the front of the pack is last thing you want to see in a NASCAR race at Talladega Superspeedway. This wreck probably should have collected about half of the field, but appears to have only got two or three trucks because of some damn good saves. Just watch this madness. It all started when William Byron, Chase leader in the Camping World Truck Series, smacked into the back of the No. 05 of John Wes Townley. It looked like Townley would go pin balling through the field, but most of the trucks somehow managed to dodge him. It was like an act of the racing gods. The wreck did, unfortunately for his Chase chances, send Daniel Hemric into the wall. If you haven’t been able to tell, those Chase drivers haven’t had the easiest time so far this year. Seriously, What Is Going On With NASCAR&apos;s Championship Drivers?